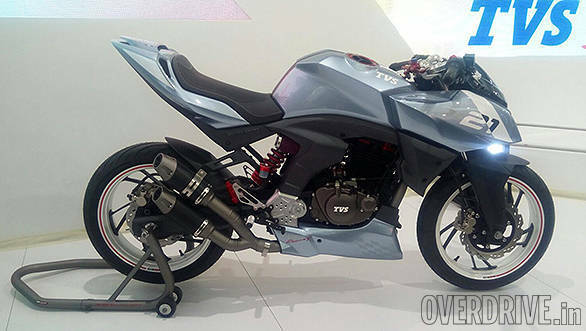 TVS Motor Company showcased the X21 concept at the Auto Expo 2016 which is a racing concept based on the company's Apache RTR 200 that was launched recently. Like all race oriented motorcycles, the TVS X21 concept has been designed to keep the weight as low as possible and also packs a race tuned engine. It is half-faired and the combination of smooth lines and sharp edges highlight the muscular and aggressive look of the motorcycle. The TVS X21 concept is powered by a 212.4cc, fuel injected, four-valve engine which has been tuned for top-end power.It gets twin oil coolers which ensure more efficient circulation and cooling. The twin straight flow air filters ensure cleaner combustion while the twin free flow canisters ensure a sporty exhaust note. The X21 race concept has a telescopic front suspension and a gas-filled rear monoshock. The instrument console is fully digital and apart from the speedometer and tachometer, it has a trip meter, clock, acceleration timer and lap timer. It comes equipped with race oriented components like a engine performance kits, race levers and a steering damper for stability and control at higher speeds.